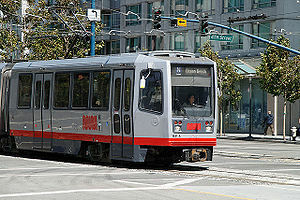 Muni Metro is the name of the light rail component of the San Franicsco Muni system. In downtown San Francisco, all lines operate in the subway under Market Street (with downtown stations shared with BART). 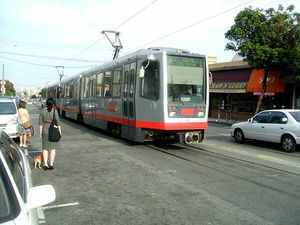 Outside the downtown, Muni Metro vehicles operate mostly on street, often in mixed traffic. Fares on Muni Metro is the same as Muni buses and all passes and transfer apply to both modes. Shuttle - Operate on weekday peak hours only between Embarcadero and Castro, and before and after Oracle Park events between West Portal and 4th and King. Service begins at 5am to 1am on weekdays, 7am to 1am on Saturdays, and 8am to 1am on Sundays. At other times, buses provide substitute service along most of the routes. Muni Metro stops at platform stations (see map above) and on-street stops (which resemble bus stops and are located every few blocks). Some on street stops have boarding island. Others have a sign on the curbside and require riders to board on the roadway. Motorists are required to stop before the Metro vehicles to allow riders to board. When boarding Muni Metro at any of the subway stations, you need to buy a ticket or show pass/transfer at the station before you proceed to the platform. When boarding at a surface stop (platform or on-street), you can pay the cash fare on board behind the train operator. Others with pass, transfer, or Clipper card can board through any door (Clipper reader is available at every door). If you pay cash, you need to keep the transfer or ticket as proof of payment. Random fare inspections take place onboard Metro trains and at downtown Metro stations inside the paid area. On the train, announcements will be made for the next station (in the subway). Pull the stop cord by the windows to request train stop. Except underground stations, train will skip stops if no one is waiting on the platform and no one has requested to disembark. Muni Metro does not allow bicycles. 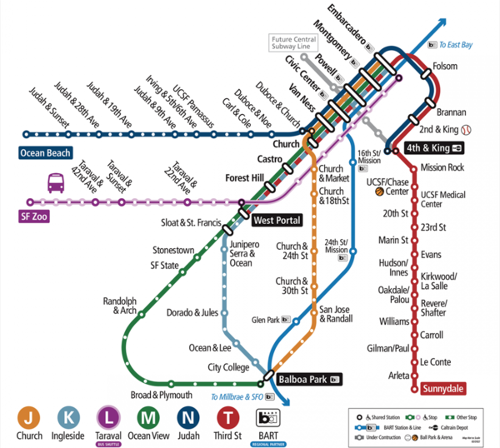 Even though Muni Metro is accessible, accessing the system is quite complicated given the various types of stations and stops on the systems. Wheelchair riders should board on the front door of the front car. At all underground stations, elevators are available between surface and concourse, and between the concourse and platform. Call Muni at 311 or (415) 554-6999 for updates on elevator availability. All surface stations that feature high-level platforms (like those on the T line) are accessible through ramps. For the rest of the system, select surface stops (see map above with grey circles) provide wheelchair access through wayside wheelchair ramps. To board Muni at these stops, wait on the top of the ramp. This page was last edited on 10 January 2019, at 22:55.